Female-focused site The Daily Muse officially launches today, wanting to provide smart women with a place to go online for relevant content that doesn’t dumb itself down. 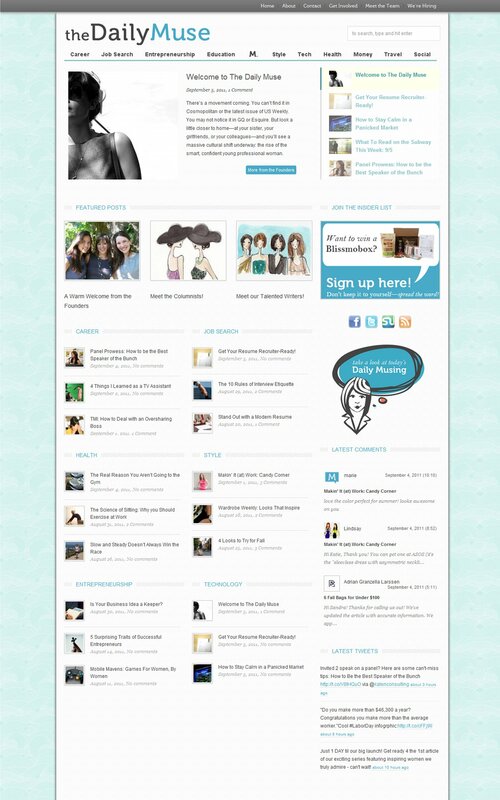 Positioning itself between glossy magazines like Cosmo and The NYTimes and targeting the 20-35 year female demographic, the Daily Muse will concentrate on providing daily content across career-oriented topics like Entrepreneurship and Education as well as touching upon more extracurricular pursuits like Fashion and Travel. Founded by ex-McKinsey analysts Kathryn Minshew, Alexandra Cavoulacos and Melissa McCreery, The Daily Muse kicks off with eight editors and 11 columnists and has already begun to foster a community of influential females as volunteer contributing writers. It starts out at launch with the “Lessons to my younger self” series, bringing together women like AOL media boss Arianna Huffington and Change The Ratio’s Rachel Sklar to write out the life advice they would have given their younger selves now that they know better. Minishew tells me that the fact that there were few other online publishers targeting ambitious young women is what finally convinced her to move forward with the idea. Minishew plans on monetizing The Daily Muse by setting up a job board in the coming months, in order to hook up talented successful women with the companies that want to hire them. She also plans on eventually charging for The Daily Muse-branded professional development training courses. The site is currently bootstrapped and will also be raising money via IndieGoGo.